There have been countless climbing challenge ideas thrown around amongst Boone climbers, ranging from the stupid (e.g. “the 24 challenge”) to the silly (e.g. naked climbing), but last weekend Carson decided to celebrate his 21st birthday by laying down the hammer on 21 of his favorite v5 boulder problems around Boone. Test yourself: Can you name all 21 of these climbs? Click the image and zoom to make it reeeeaalll big so you don’t have to be all squinty-faced while you play the guessing game.. The Bakker boys, two Zachs, and myself set out on this grand undertaking. It was a big dream and we knew it would take the whole day. With a puppy in tow, we set off, unsure of our chances of success, but determined to spend a beautiful day among trees, rocks, and friends. The final numbers at the end of the day were 21 climbs completed in 11 hours, with ~10 miles total hiked up and down and around virtually every single area of Blowing Rock, 221, and Grandmother. We left around 8am and made it back to Boone a little after 7pm. Carson and Drexel day flashed every single boulder except for two, and each one of them blames the other for bad beta. I was impressed by Carson’s commitment to staying true to the goal of exactly twenty-one v5s. Besides our initial warm-up, he did not lay a finger on a single other grade. I don’t know how doable this venture would have been if we had picked a higher grade or if Carson had just turned 50 years old instead of 21, but it surprised all of us how easy this was. Okay, maybe not “easy” but it certainly wasn’t as brutal as we had imagined. I only spotted a couple chicken wings and the guys actually cruised through the last few boulders of the day pretty smoothly, versus the dramatic pumping out and screaming and grunting one might expect after a long circuit day. Highlights of the day, according to Drexel, were Cocaine Highway (a tall, scary rock face that is so unnerving Carson giggled like a little schoolgirl at the top) and finishing the day on the Long Wall classics. The weather was perfect all day. Fall called and said she had a good time visiting and will be back in a couple weeks for a longer stay. I can’t wait to spend many more weekends in Boone getting my skin and psyche ready for prime climbing season! Don’t forget to register for Hound Ears! Check out the photos of our day and see if you can name every single one of the climbs. Is there a v5 you think we missed? Let us know in the comments below. I hope they found what they were looking for. This past weekend Appalachian State University’s climbing team hosted their spring climbing competition, Southern Comfort XVI. It was a total blast! I haven’t competed in ages, and I thought it would be a fun excuse to visit all my friends in Boone. I didn’t climb as well as I had hoped, but placed #1 in Women’s Advanced and came home with two sweet Organic bags. When I first got into the gym and started feeling out the problems, I’ll admit that I experienced a fair share of frustration at so many climbs being height-dependent. In general, I feel there is a lack of understanding in gyms about how short a “short person” is. Perhaps setters just don’t believe a person can really be so short? I understand sometimes larger moves can be compensated for with tricky beta, and sometimes it’s just my fault for not being strong enough. But especially at indoor comps, it can feel like being a child on one of those roller coasters when you just don’t meet the height requirement and you have to stand by and watch all your taller friends having the time of their lives. Just as a quick ruler idea from Drexel: when setting a move that is not intended to be a dyno, check the span from one fingertip to the opposite elbow. This may seem ludicrous, but that is actually my span compared to his. THIS ^ IS MY LIFE! Accepting the fact that I would not be able to do some problems, I decided to give everything a three-go limit, starting with the hardest problems and working my way down. I’ve learned from previous comps that sieging is not the way to go. It quickly became apparent that all the advanced problems and most of the higher level intermediates were not feasible. I felt my capacity to let this get to me. I felt the tension and despair in other climbers. I saw other shorter girls getting upset. I actually saw one girl crying. But I didn’t want to go there. It’s not “real.” It’s just a fun gym competition. I forced myself to reframe the situation and told myself that it was my attachment to a certain outcome that was the problem, not the outcome itself. 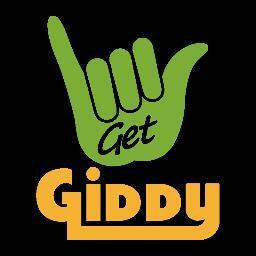 If the ultimate goal is fun or happiness, then winning a comp should really just be a middleman. Which means it is completely arbitrary. I shouldn’t need to “win” to have fun and feel good about myself. I had left the competition early to answer my phone, went back inside to turn in my scorecard, and then finished up dealing with some really ridiculous situations going on back home — one of the plights of being an on-call therapist is that I have to stop whatever I am doing, 24/7, and deal with a client who was, in this situation, pooping all over the place as a power move against their parents. And then I got another call about a person trying to kill herself and had to somehow wave my magic wand and fix everything. Sometimes I wonder why on earth I would choose to work in the mental health field, especially with high-level children and their families. Why didn’t I just stay in the minivan with Drexel, where everything was clean and calm and free of feces? I took a walk to clear my head, ate lunch, cuddled my puppy, and still ended up scoring a front row seat to watch finals. I got super excited watching Melise, Rose and Kelsey cruising through all the Women’s Finals problems. I appreciated that they switched up the format from top 3 coed to having both the top 3 males and top 3 females compete. Everyone took their seats and the heat was on. You can’t see it, but that dude on the right was super jealous of Melise’s guns (do you have a permit for those?). Carter was able to make that cool face in the split second after noticing I was take a photo. That takes some mad skillz. When everything was said and done, it was a great competition and a great weekend. Everyone went home with something cool, whether or not they placed, because of the insane amount of raffle prizes. On top of that, we ate Cha Da Thai for dinner two nights in a row, some ladies took the plunge and bought themselves a pStyle, AND we (minus Carson) had a really nice group hug slash kumbayah circle to say goodbye. Already looking forward to our next trip back to Boone! Photo stolen from http://cruxcrush.com. This could be you! Comment below and you’ll be entered in a drawing to win your very own pStyle!!!! Drexel is still on the road, doing his best to keep the cross country crimpers alive and crushing projects left and right. He claims his fingers are so sore from climbing that he’s unable to write any of his own entries, so here’s a quick list of his latest sends: Osiris V10, Bubba Gump V10, Bread Loaf Factory V10, and the most epic, Western Gold V11. I mainly know about these sends because I’ll be at work, in my “big kid” job as a therapist, in a session with a client who is yelling or crying or throwing things, when my phone will blow up with ten texts consisting primarily of exclamation points and excited emoji faces. My first thought when I hear the continuous earthquake vibrations of my phone is, “Uh oh, someone else is in crisis!” so I’ll find some excuse to check the screen. Lo and behold, Drexel has triumphed again! “I did it! I did it! I did it!” he texted. 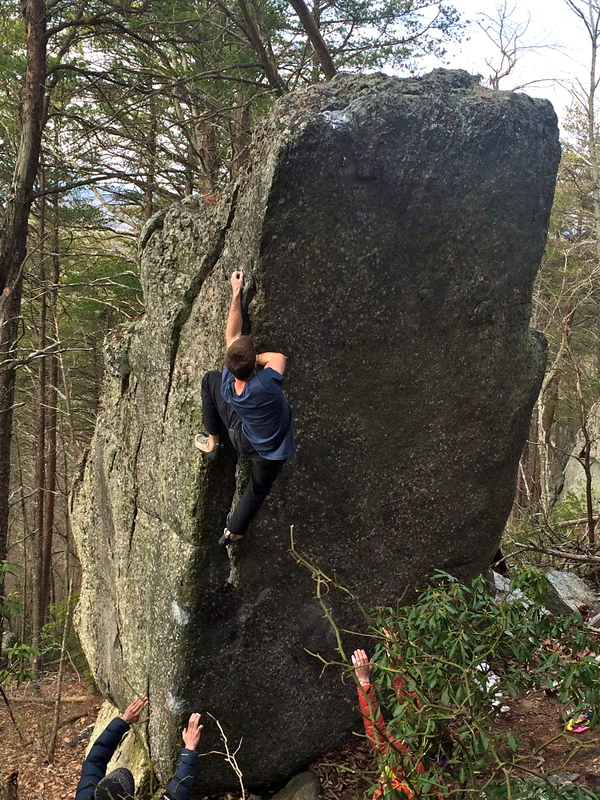 This past weekend I was lucky enough to join Drexel, Carson and Jeff on a lovely outing to Dixon School Boulders. If you’ve never heard of this place, check out this neat video starring Zach and the Bakker boys talking about Dixon and sending some of the classics. As Zach says in the video, it’s definitely worth checking out, spending a day amongst the trees and rocks on a beautiful, quiet mountainside with gorgeous views. 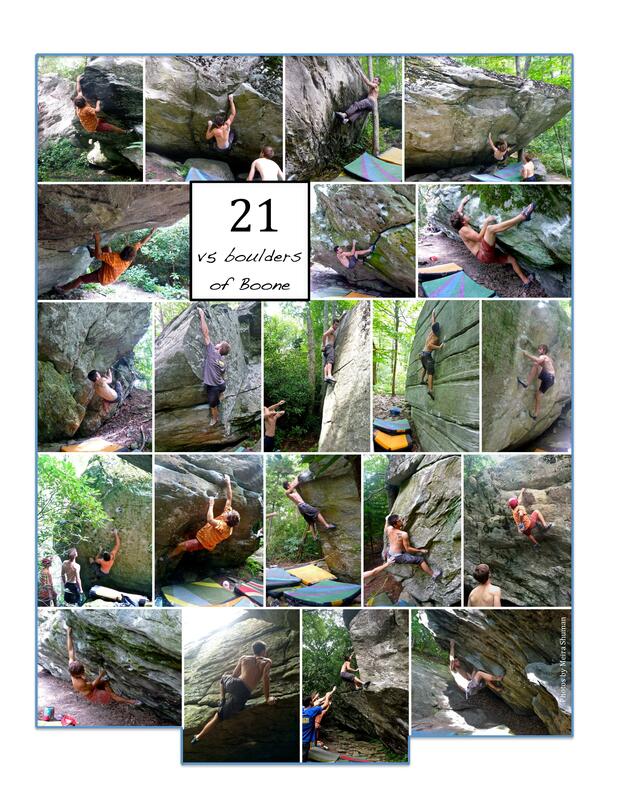 Dixon boulders is a small bouldering area owned by Crowders Mountain State Park near Kings Mountain, NC. It’s maybe 1.5 hrs from Asheville, 2.5 hrs from Boone. It’s a metaconglomerate rock, which might mean nothing to climbers except that the grain size and quality changes drastically from one end of the boulder field to the other. There are maybe 40-50 total climbs, with only 20-25 being high quality and a couple big projects still waiting for a strong climber to give them a name. We first warmed up at a large chunk of rock containing countless fun v0-v3s and also a tricky barndoor problem courtesy of Ian Rogers called Barnyard Banshees v5. From there we moved up the hill to Classic Overhang v3 and Beelzebub Roof v5. Zach makes this climb look easy in the video and Jeph flashed the pants off of it, but I struggled pretty hard to gain momentum to reach certain holds and still have enough power to clamp down on the pebbles up top. I flailed a bit, grunted, sighed, told the group we could move on, started to pack up, and then had a sudden burst of angry determination that I was able to ride to a final send. WHOOSH. Sometimes there really is power in a “last go, best go” gritty determination. Image captured from Dixon School Boulder video of Zach on Beelzebub v5. We tromped our way up and over to one of the best boulders at Dixon, Atlas v7. It starts with a really fun traverse leading up to a tricky face slab. Lil Bakker wistfully projected this boulder back in the day, and now he’s a lean mean climbing machine who eats v7s for breakfast. Jeph claims he doesn’t do a lot of yoga, but he hand-foot matched like a regular downward dogger and said, “Namaste? Nah, mus’ go!” as he flowed to the top of Atlas v7. For the record, I have never felt so supported in my entire climbing life as I did on Atlas. After everyone else sent, Carson, Jeph and Drexel became the world’s best support crew. They showered me with compliments and offered wild incentives that tapped into my deepest desires. Here I was on the brink of complete life satisfaction, and…. nothing. This might be my biggest deathbed regret. Next up was Drexel’s biggest project, the terrifyingly tall Leaning Tower v8. It’s arguably one of the best lines at the park, but is also extremely tall and intimidating and has a very committing last move. In the end, the fear factor was too much. This is a really good example of how sometimes climbing is more mental than physical – if this move was only a couple feet above the ground, it would be a relatively easy dyno. Take that same dyno and move it 20+ feet off the ground and that’s another story. Even scrolling through the photo takes a long time! We ended the day on Venom v5 and Venom Direct v6, completing Jeph’s Dixon circuit experience. We marched back to the Crowders Mountain State Park parking lot with smiles on our faces. We all agreed that the pebbles hurt, but our skin looked a lot better than it had before. My gym skin definitely needed some good pebbly scraping to get it ready for next weekend’s trip to Rumbling Bald. Back at home, we had a lovely night with Drexel and Carson’s family, even when arguments got a bit heated. I felt bad, but we even pulled his Nana into the argument. In the end, it was hard to find a clear winner of “What is the cutest baby animal?” We’ve narrowed it down to five top contenders: Dik-Dik, Slow Loris, Wallaby, Wolf, or Panther. Please vote in the poll below so we can figure this out once and for all. My vote was for Dik-Dik! It’s tiny, it’s awkward, it has oddly tiny ankles, what’s not to like? I won’t lie. I’m biased. So Dik-dik times TWO! Adult Slow Loris look like Pokemon. TIL: Even black panthers have spots. Words cannot describe the pure childlike glee of watching people casually crush their long-time projects like it ain’t no thang. Trey (seen below) walked Sherman Photo Roof V7 the way you can brush your teeth with your eyes closed. It takes a lot of confidence and tenacity to come back to a climb that caused so much heartbreak the previous year (he repeatedly fell off the last move to a jug after doing the crux moves). By now, he could probably do all the moves in his sleep. I think many people would just throw in the towel and say “No way, I’m never touching this rock again!” But not Mr. Ronald Worley the Third. No, not him. This is a shining example of what a positive attitude can do. Another example would be the tall, indescribable Mr. Ryan. He drove all the way to Rocktown, shivered himself to sleep in his tiny car (scientists are still puzzled how an 8 foot man sleeps inside a 6 foot car), and hiked around in the miserable mistiness. I had assumed everyone who dealt with the elements did so because they were determined to climb. It wasn’t until I had already left that I realized Ryan hadn’t climbed at all! Dealing with a shoulder injury and potentially needing surgery, he came out just because he was so incredibly psyched to hike around outside and cheer on his friends. He never once mentioned his shoulder. He never complained or seemed disgruntled with his lot in life. So HIGH FIVE Ryan. I know plenty of people, including myself, who have let an injury completely crumple their world. They become angry and embittered, slaughtering gallons of ice cream and muttering curses to the rock gods. Or worse, they try to climb through an injury, realize it hurts or is getting worse (no duh), and throw a temper tantrum. So next time you’re griping about your sore fingers, just think, “What Would Ryan Do?” (WWRD). WWRD? Look mysterious on a rock. Another remarkable feat of tenacity was Carson’s return to Big Bad Right V8. Last year he took a bad fall and severely sprained his ankle on this very climb. Today, without even breaking a sweat, he cruised through the powerful moves and did a little dance at the top. Ian, not to be outdone, stole Carson’s beta and sent, riding high on his previous sends of Brown Hole V8 and Triple Threat V9, and then later got way too excited on Price is Right V8. For those of you who haven’t met Ian, first of all, I’m sorry. But he’s one of those annoying guys who can hop off the couch after not climbing for months, casually crush your project, and then tell a really good joke about it that makes you laugh in spite of yourself. Fun fact: he is also really good at dancing with his head pressed against the roof of a car. Carson working out the moves of Golden Harvest V10. Experimenting with some barely existent intermediates on The Tao V8. One of my favorite parts of this trip was taking a group of first-timers to Rocktown and showing them all the fun classics. Macee did her first outdoor v3 on the heart-pumping Mario. Hurray! It’s exciting to watch people overcome challenges regardless of the grade. If you can only congratulate someone on climbing a v12+, you might need to brush up on your invisible ethics of climbing. After a hard day of climbing, we were all looking forward to stuffing our faces with Mexican food. Everyone knows one of the best perks of Rocktown is eating at Los Guerrero’s afterwards. Alas, it was closed! What were we to do?!?!? In a small town like Lafayette, there’s really not much else except McDonalds. In this small town, I’m sure the sight of six cars driving around an empty parking lot looked pretty suspicious. Luckily we own things called smartphones, which led us to small, off-the-beaten-path chinese buffet down the street. It wasn’t amazing, but it was food, and they had seating for all 12 of us. Right alongside bottomless greasy lo mein and peanut chicken, they also had an entire array of stereotypical American fried foods. With all-you-can-eat ranch dressing. Mmmboy. Do you see Ian massaging his meat down there? Kyle getting down and dirty with some noodles. When we couldn’t fit any more fried donuts and ice cream in our bellies, we lined up at the register to pay. They must have miscounted our party number, because when the last person was lined up they demanded payment for two. Flustered and unsure of themselves, the person said, “Oh, there’s someone still in the bathroom” and quickly beelined for the door. And as the last car squealed out from the parking lot, a little Chinese lady ran after them, screaming and waving her hands in the air.